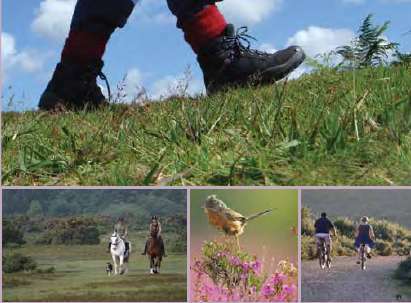 Last year the New Forest National Park Authority launched a review of the Recreation Management Strategy (RMS), its core policy document for Recreation. With over 60 action points over 60 pages, it is very wide ranging, but also fuzzy, aspirational, and many of its projected tasks are yet planned, let alone achieved. We welcomed the review with the hope that a more practical and focused update would lead to needed change. In Summer 2017 the Authority launched the review with the “Forest First” online survey. Whilst, as far as we were concerned, this may have been a good PR exercise to raise the profile of the RMS review, the survey itself was flawed in its format, execution and interpretation. The Strategy needs to address many statutory obligations to habitat, to commoning and the working forest, and a complex mesh of overarching issues including wider town and country planning across the region. Reducing many aspects of this to an online poll ranking whether walking, cycling, or golf are more important than cricket, camping and coastal access, is an unhelpful distraction seemingly promoting activities rather than looking at their impacts and how best to minimise them. We criticised the format and unintended messages of the survey in the very brief window afforded in the Public Questions at the July 2017 Park Authority meeting. At the January 2018 meeting we criticised the faulty interpretation of the results. At the May 2018 Verderers Court we raised concerns over the plan to run a second survey intended to be a final consultation with the public on the new document. The survey has now been launched to consider 25 “Actions” spread over 7 “Objectives”. Whilst these are hodgepodge of bland guiding principles there is almost no substance. We support most of these principles, but specific policies, projects and initiatives are needed to form a strategy. These blandishments on offer in no way improve on the existing 2010 RMS document. The online survey merely provides an opportunity for the public to “rate” these “actions” on a five point sliding scale from strongly agree to strongly disagree. A 2000 character limit box (that’s nearly 14 tweets worth to the social media generation) allows a more “in-depth” response to the entirety of this from each respondent. This is less a survey than a rubber stamping exercise. The survey closes at 11.59pm on 12 August. Coming soon! Our suggestions for responses. What should be retained from the original RMS. What we think of the proposed “Actions”. Some projects we’d want to see proposed instead. And where we should set or lower our expectations for what the Park Authority can achieve if it only adopts these principles without offering a more concrete strategy. Latest update 7 August 2018. Error: Error validating access token: Session has expired on Sunday, 10-Mar-19 01:16:56 PST. The current time is Tuesday, 23-Apr-19 11:08:51 PDT.